People with hepatitis B who switched from the old tenofovir disoproxil fumarate (TDF) to the new tenofovir alafenamide (TAF) saw improvements in kidney function biomarkers and recovery of bone loss, researchers reported at the International Liver Congress last week in Amsterdam. The congress is the annual meeting of the European Association for the Study of the Liver (EASL). Due to its good efficacy and improved safety profile, updated EASL hepatitis B clinical practice guidelines released at the conference now recommend TAF as a new treatment option, especially for people at higher risk for bone or kidney problems. Tenofovir disoproxil fumarate (Viread) is one of the most effective antiviral drugs for hepatitis B and is among the most widely used antiretrovirals for HIV. It is generally considered safe and well tolerated, but it can cause bone loss and kidney problems in susceptible individuals. Tenofovir alafenamide is a new pro-drug formulation that produces high levels of the active drug (tenofovir diphosphate) in hepatocytes and CD4 T-cells with smaller doses than TDF, which means lower concentrations in the blood and less drug exposure for the kidneys and bones. In January, the European Commission granted marketing authorisation for stand-alone TAF – marketed as Vemlidy – for hepatitis B, following US Food and Drug Administration (FDA) approval in late 2016. Previously it was only available in coformulations for HIV treatment. Nucleoside/nucleotide analogues like tenofovir suppress hepatitis B virus (HBV) replication during treatment, but they usually do not lead to a cure. Ongoing therapy is generally required and long-term safety is important. 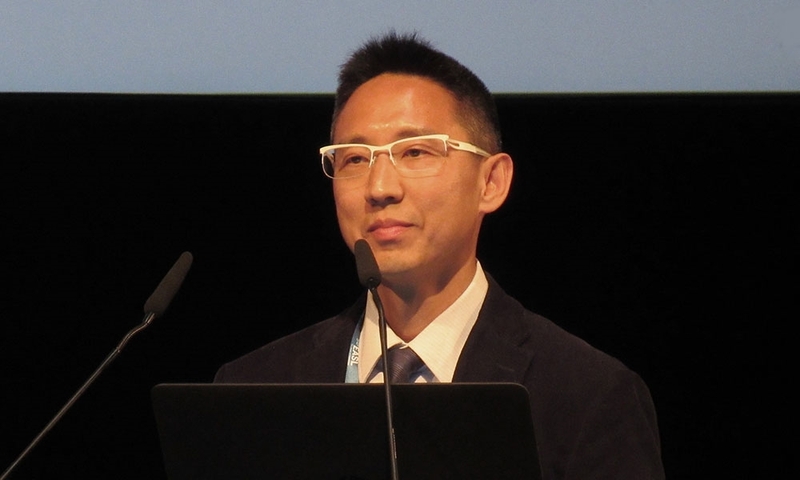 Henry Chan of the Chinese University of Hong Kong presented a pooled analysis of bone and kidney safety in two long-running head-to-head studies comparing TAF and TDF. This analysis focused on people who switched from TDF to TAF. Gilead Sciences’ Study 108 enrolled 425 hepatitis B ‘e’ antigen (HBeAg)-negative participants and Study 110 enrolled 873 harder-to-treat HBeAg-positive patients. In both studies a majority of participants were men. The average age was around 46 years in Study 108 and 38 years in Study 110. Approximately 70% and 80% of participants, respectively, were Asian, and HBV genotype C was most common. Initially participants in both studies were randomly assigned to take 25mg TAF or 300mg TDF once daily for 96 weeks, followed by open-label TAF through 144 weeks. Part way through, the FDA required the study to extend its double-blind period to 144 weeks and the open-label extension to 384 weeks. This offered the opportunity to do an unplanned analysis of a subset of participants who completed 96 weeks of randomised treatment and started open-label TAF, without joining the longer protocol. At the Liver Congress, Maurizia Brunetto of the University Hospital of Pisa presented full 96-week safety and efficacy findings from Study 108, while Kosh Agarwal of King’s College Hospital in London did so for Study 110. Overall, the 96-week efficacy results did not differ much from the 48-week results presented at last year’s Liver Congress. In the HBeAg-negative study, 94% of TAF recipients and 93% of TDF recipients had undetectable HBV DNA at 48 weeks. At 96 weeks the results were similar, 90% and 91%, respectively. Hepatitis B surface antigen (HBsAg) levels declined slightly in both treatment arms and only one patient on TAF experienced HBsAg loss with seroconversion, generally considered a cure. Significantly more people in the TAF arm had ALT normalisation according to AASLD (American Association for the Study of Liver Disease) cut-offs (50% vs 40%, respectively). In the HBeAg-positive study, response rates improved a bit with longer follow-up. At 48 weeks, 64% of TAF recipients and 67% of TDF recipients had undetectable HBV DNA, rising to 73% and 75%, respectively, at 96 weeks. Two people achieved HBsAg loss and one experienced seroconversion. Again, ALT normalisation was more likely in the TAF group (52% vs 42%, respectively). In both studies, treatment remained generally safe and well tolerated. Bone mineral density at the hip and spine remained stable in the TAF arm while declining in the TDF arm. Kidney function, as indicated by estimated glomerular filtration rate (eGFR), likewise remained stable in the TAF arm while falling in the TDF arm. Chan presented a preliminary pooled analysis of the subset of patients who completed 96 weeks of randomised treatment plus 24 weeks of follow-up on open-label TAF (120 weeks total). Within this group, 361 people who were initially randomised to TAF stayed on that drug, while 180 people initially assigned to TDF switched to TAF. In the pooled group, 60% were HBeAg-positive. Viral load remained suppressed during the open-label period: 88% of patients in both the ongoing TAF group and the TDF to TAF switch group had undetectable HBV DNA at 120 weeks. Other study findings showed improvements after switching to TAF. Although more people assigned to TAF experienced ALT normalisation during the randomised portion, ALT continued to fall over time. At 120 weeks, 63% of people in both the continued TAF group and the switch group achieved ALT normalisation. Looking at kidney function, during the randomised portion creatinine clearance remained stable in the TAF arm but dropped in the TDF arm. Among those who switched from TDF to TAF, it rose again. People with moderate or worse kidney disease saw a significant improvement, from a median of 76 to 81 ml/min. Two measures of proteinuria increased more in the TDF arm during the randomised portion, but improved after switching to TAF. Bone mineral density, especially at the hip, increased among people who switched from TDF to TAF. Biomarkers of bone formation and resorption were more favourable in the TAF arm during the randomised portion. These biomarkers improved among people who switched from TDF to TAF, eventually equalling levels seen in patients who were on TAF all along. "A similar high rate of viral suppression (HBV DNA < 29 IU/ml) was maintained through week 120 in chronic hepatitis B patients who received TAF treatment and those that switched from TDF to TAF treatment after 96 weeks," Chan and colleagues concluded. "Chronic hepatitis B patients showed improvements in bone and renal safety profile 24 weeks after switching from TDF to TAF." Chan said that a phase 3 trial is now testing the safety and effectiveness of switching from TDF to TAF, as the present study was not designed to do so. However, randomised studies have seen favourable outcomes after people with HIV switched from TDF to TAF, including people with HIV and HBV co-infection. "Instead of waiting for patients to get renal disease or bone disease, we should be more pre-emptive in trying to minimise these comorbidities," Agarwal said at the hepatitis B guidelines presentation. "We are seeing changes in bone turnover and renal markers that are not quite translating to clinical endpoints yet, but we have the data on co-infection and we understand that the efficacy [of TAF] is strong, so we should be thinking about the prevention of comorbidities for what is still a long-term therapy for a majority of patients." Chan HL et al. Improved bone and renal safety of switching from tenofovir disoproxil fumarate to tenofovir alafenamide: preliminary results from 2 phase 3 studies in HBeAg-positive and HBeAg-negative patients with chronic hepatitis B. International Liver Congress, abstract PS-041, 2017. Brunetto M et al. A phase 3 study comparing tenofovir alafenamide to tenofovir disoproxil fumarate in patients with HBeAg-negative, chronic hepatitis B: efficacy and safety results at week 96. International Liver Congress, abstract PS-042, 2017. Agarwal K et al. A phase 3 study comparing tenofovir alafenamide (TAF) to tenofovir disoproxil fumarate (TDF) in patients with HBeAg- positive, chronic hepatitis B (CHB): efficacy and safety results at week 96. International Liver Congress, abstract FRI-153, 2017.